Before the punchclock was invented, employers monitored the working hours of their employees by using paper time sheets or by conducting visual checks. Such methods proved very unreliable, however, because, as timesheets were filled in by the employee they were vulnerable to potentially falsified information, and visual checks could often disputed. There was a high demand from employers for a time clock system to be developed, that could deliver attendance and payroll information automatically, and as result, punchclock systems were created. Initially the punchclock relied on a mechanical card punching system. The employee inserted a heavy paper timecard into the time clock slot. When the card connected with the rear of the time clock slot, the time clock would stamp day and time information on to it. The timecards that the employees were responsible for keeping up-to-date usually had 'time in' and 'time out' areas marked on them so that they could "punch in" or "punch out" in the correct place, hence the term 'punchclock'. Such systems did manage to record generally accurate information, but they often proved to be quite limited. Mechanical punchclock systems still required a timekeeper to tally and calculate working hours in order to issue correct payments to employees, allowing the potential for human errors and disputes. Furthermore, the system, in general, was open to abuse, as employees could have others process the punchclock data on their behalf, producing inaccurate information leading to false claims for payment. With the advent of computer technology, the punchclock system was revolutionized. During the 1990's, punchclock technology moved away from the mechanical systems to computer-based tracking systems, and there was a great deal of investment in punchclock software development. Swipe-card systems linked directly to time clock computer systems monitored employee activity in much greater detail, and with much greater accuracy. Employees were able to clock in and out for lunch, and periods of time 'out of the office', presenting the employer with a greater depth of tracking information, and also providing computer based reports that were difficult to dispute. In recent times, punchclock software has been developed to a very high standard. Punchclock software products can now deliver a range of information, which is accurate, to the nearest second, to record timesheets and generate reports, which are fully customizable to integrate with the company's payroll systems, through which invoices and accounts can be produced. 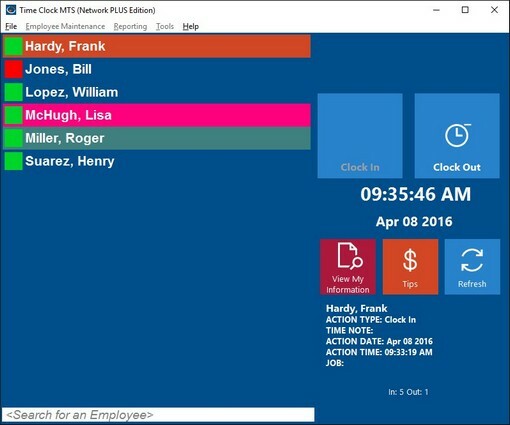 Punchclock software is now used by businesses of all sizes, presenting valuable information, which is necessary for payroll information, but also for the daily management of business administration. Employees are able to see who is available, at work, at a glance. Clocking in and out times can be broken down to departmental or shift cohorts, presenting data which is very valuable in managing projects or monitoring and evaluation departmental performance. In fact, punchclock technology has progressed so far, since early mechanical time clock systems that the very application of the punchclock concept has evolved, almost as much as the technology itself!